An integrated circuit (IC) on a printed circuit board. This is called a solid state circuit because all of the electrical action in the circuit occurs within solid materials. Solid-state electronics means semiconductor electronics; electronic equipment using semiconductor devices such as semiconductor diodes, transistors, and integrated circuits (ICs). 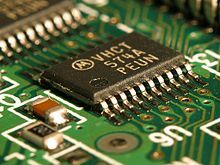 The term is also used for devices in which semiconductor electronics which have no moving parts replace devices with moving parts, such as the solid-state relay in which transistor switches are used in place of a moving-arm electromechanical relay, or the solid-state drive (SSD) a type of semiconductor memory used in computers to replace hard disk drives, which store data on a rotating disk. The term "solid state" became popular in the beginning of the semiconductor era in the 1960s to distinguish this new technology based on the transistor, in which the electronic action of devices occurred in a solid state, from previous electronic equipment that used vacuum tubes, in which the electronic action occurred in a gaseous state. A semiconductor device works by controlling an electric current consisting of electrons or holes moving within a solid crystalline piece of semiconducting material such as silicon, while the thermionic vacuum tubes it replaced worked by controlling current conducted by a gas of particles, electrons or ions, moving in a vacuum within a sealed tube. Although the first solid state electronic device was the cat's whisker detector, a crude semiconductor diode invented around 1904, solid state electronics really started with the invention of the transistor in 1947. Before that, all electronic equipment used vacuum tubes, because vacuum tubes were the only electronic components that could amplify, an essential capability in all electronics. The replacement of bulky, fragile, energy-wasting vacuum tubes by transistors in the 1960s and 1970s created a revolution not just in technology but in people's habits, making possible the first truly portable consumer electronics such as the transistor radio, cassette tape player, walkie-talkie and quartz watch, as well as the first practical computers and mobile phones. Today, almost all electronics are solid-state except in some applications such as radio transmitters, in which vacuum tubes are still used, and some power industrial control circuits which use electromechanical devices such as relays. Additional examples of solid state electronic devices are the microprocessor chip, LED lamp, solar cell, charge coupled device (CCD) image sensor used in cameras, and semiconductor laser. ^ Murty, B.S. ; Shankar, P.; Raj, Baldev; et al. (2013). Textbook of Nanoscience and Nanotechnology. Springer Science and Business Media. pp. 108–109. ISBN 3642280307. Archived from the original on 2017-12-29. ^ Papadopoulos, Christo (2013). Solid-State Electronic Devices: An Introduction. Springer Science and Business Media. pp. 5–6. ISBN 1461488362. Archived from the original on 2017-12-29. ^ Vaughan, Francis (February 22, 2012). "Why the expression "solid state" instead of simply "solid"?". StraightDope message board (Mailing list). Archived from the original on December 7, 2017. Retrieved December 5, 2017. ^ "What does solid-state mean in relation to electronics?". How Stuff Works. InfoSpace Holdings LLC. 2017. Archived from the original on December 7, 2017. Retrieved December 5, 2017. ^ "Solid state device". Encyclopaedia Britannica online. Encyclopaedia Britannica Inc. 2017. Archived from the original on August 1, 2017. Retrieved December 5, 2017. ^ Campardo, Giovanni; Tiziani, Federico; Iaculo, Massimo (2011). Memory Mass Storage. Springer Science and Business Media. p. 85. ISBN 3642147526. Archived from the original on 2017-12-29.